Growing roses from seed is not the quickest way to propagate roses but it can be the most rewarding. It is also the best way to hybridise roses in order to create brand new varieties. Of course there will be disappointments as some of your seed won't germinate at all, and annoyingly you will always lose a certain percentage of seedlings to damping off disease. Unfortunately, once you get your seedlings to a size where they will bloom you will need to prepare yourself for yet more disappointment. Why? Because some of your creations will be as ugly as sin, while others will be just plain boring! However the point of all your work will become as clear as a lead crystal goblet as one of your rose seedlings may turned out to be something quite special! 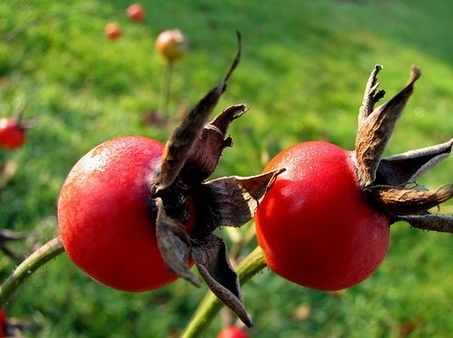 When do you harvest rose hips? 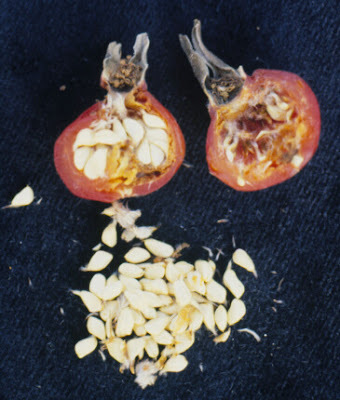 Once the fruit (rosehip) has fully formed, wait four months before harvesting the seed. Some rose hips would have turned orange, red or yellow to prove that they are indeed ripe, but others can stay green even when over ripe. Once your rose seed has been collected, soak them overnight. Then in the morning, discard any seeds that are floating as these will produce either weak seedlings or not germinate at all. Strain the seeds of and then - wait for it - place into a blender with some more fresh water. Turn the blender on to LOW and whizz for a few seconds in order to remove most of what is left of the pulp. You may lose a few seeds here but you can always skip this step - especially if you are short of seed. Alternatively you can clean the pulp from your rose seeds by spreading them out on a clean cloth or towel and scrubbing over them with a suitable brush. Be aware that this can end up being quite a lot of work. From this point, professional rose grows tend to chill their seeds from between six to ten weeks before planting as this will encourage germination. If you leave them in any longer, is has been known for rose seeds to germinate in the fridge! The most popular method of refrigeration to place your clean, seeds onto a piece of good quality, damp paper towel. Fold the paper towel over a couple of times and then place into a sealable plastic bag. This can now be left in the salad compartment of your fridge. Rose seeds collected as late as November - and possibly as late as December and January in warmer climates - can be planted as soon as they are retrieved. However, if they have been chilled then they can be sown in early spring. If there is a risk of frost then this will need to be done under protection. Using a compost mix of 1:1 John Innes 'Seed and Potting' compost and horticultural grit or perlite, plant your rose seeds 1/2 inch deep into small, individual pots or a large shallow seed tray. Now water in with a soluble seedling fungicide such as Benlate. Allow the soil to drain off then move the pots/tray into a warm and sunny position. Place a clear cover - such as a sheet of glass or perspex - over the the pot or the pots/tray and place in a cool yet sunny position. If there is no risk of frosts then the containers can be placed outside into a cold frame. Keep the soil moist and after six weeks or so your rose seeds should begin to germinate. As soon as you seed the seedlings emerge, remove their clear cover. If the seedlings are in a cold frame then the lid can be left open during the day - don't forget to shut it at night. The seedlings will continue to sprout while the weather is cool but growth can be arrested if the young plants get to warm! 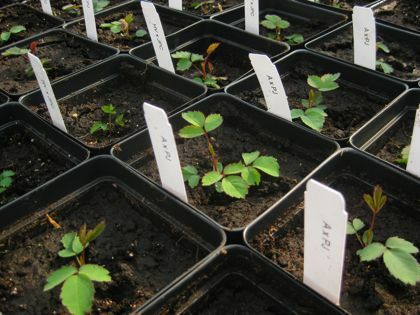 Once the rose seedlings are a few inches tall then can be potted on either into 3/4 inch pots, or if you are feeling brave then can be planted directly into a prepared bed outside. From there it will take just three years to reach maturity. Thank you for the detailed explanation. Will give it a try once I get some seeds.